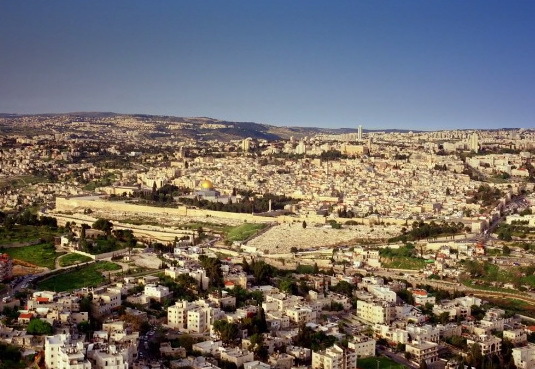 How should we approach Jerusalem, a city which for thousands of years has been regarded as a center of the world? From the West, we cross the Mediterranean Sea to Port Cities, once governed by Egyptians, Phoenicians, Greeks, and Romans. From the North, we follow the River Jordan to the Sea of Galilee. Here on these shores, a teacher known as Jesus of Nazareth preached in the synagogue of the village of Capernaum and found his first converts among the local fishermen. From the East, the Israelites and later the tribes of Arabia traversed the Judean Desert and the Dead Sea. The lowest point on earth has yielded some of the most astonishing archaeological finds of all time: from the Dead Sea Scrolls to King Herod's Palace Fortress Masada. It was here, after the destruction of Jerusalem, the group of Jewish rebels made the last stand against the Roman Army. Along the Eastern road to Jerusalem, early Christian hermits, seeking solitude in the desert, built remote monasteries, some inhabited for over fifteen hundred years. When we reach Jerusalem, which of the seven gates shall we enter? How should we navigate as time go to the alleyways shaped by centuries of processionists converging on the holy sites? The Church of the Holy Sepulchre whose great domes marked the place where many Christians believe Jesus was crucified and resurrected. The massive two-thousand-year-old stone platform with its venerated Western Wall: for Jews, it was where Abraham prepared to sacrifice his son and Solomon built the first Jewish Temple. The top of the stone platform is home to the Dome of the Rock, El-Aqsa Mosque, where Muslims believe the prophet Mohammed was taken in a miraculous night journey and ascended to heaven. Travel back in time to a land steeped in layers of history, cherished as the birth place of the monotheism. Discover the city that continues to stir the imagination of billions of people and find out why Jerusalem remains the beating heart of our world today.